I have been wanting to start making bags for men to broaden my experience and my product range, even though, thus far, there hasn’t been much demand. I figure, make it and they will come! I recently made a messenger bag art satchel for a young man and used a modification of this design to make a messenger bag for my brother. 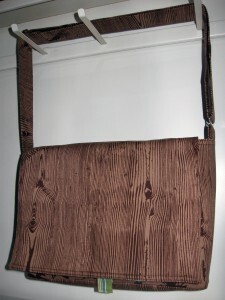 I used a woodgrain print (Joel Dewberry) for the exterior, in combination with a hard-wearing striped fabric and a coordinating print for the interior and pockets. 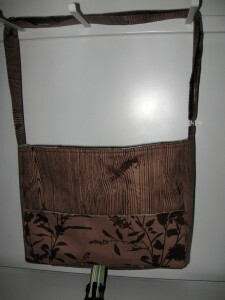 The bag has a wide, adjustable strap, key clip, parachute clip closure, pockets under the flap, large, divided pockets inside and a large pocket at the rear. 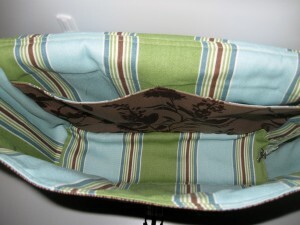 It will easily fit all the essentials they need, whilst not looking like a traditional diaper bag. 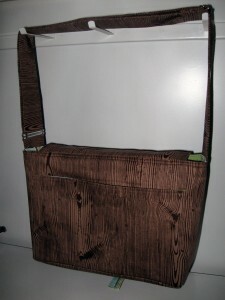 This entry was posted in man bag, sewing and tagged "messenger bag", diaper bag, Joel Dewberry woodgrain fabric, man bag, masculine bag. Bookmark the permalink.